We’d love your help. Let us know what’s wrong with this preview of Deadly Treasures by Vivian Conroy. Lady Alkmene Callender has little interest in marriage, especially when her father is up to his matchmaking tricks, but when the opportunity arises to visit an archaeological dig she cannot resist. However, when she arrives to find her potential groom under arrest for murder Lady Alkmene begins to wonder if she isn’t in the right place at the right time. To ask other readers questions about Deadly Treasures, please sign up. I've admitted defeat, I'm not going to finish this book and I have no interest in trying. DNF at 34%. I requested this from NetGalley because I'm a great fan of the 1920s/ 1930s detectives, your Agatha Christie books, your Lord Peter Wimsey etc and this looked like a series I could get my teeth into. Sadly, I found this just slooooow. I was one third of the way through the book and nothing seemed to have happened, apart from the murder of course. None of the characters engaged me, they seemed to b I've admitted defeat, I'm not going to finish this book and I have no interest in trying. DNF at 34%. None of the characters engaged me, they seemed to be caricatures rather than carefully drawn people. I would like to thank Netgalley and HQ Digital for a review copy of Deadly Treasures, the third novel to feature Lady Alkmene Callender, an aristocratic amateur sleuth in 1920s England. Alkmene is asked by her father and his friend to go and visit her childhood friend, Duncan, on his dig. Envisioning a trip to Egypt she accepts with alacrity only to find that the dig is in Cornwall and both fathers want Duncan and Alkmene to marry. 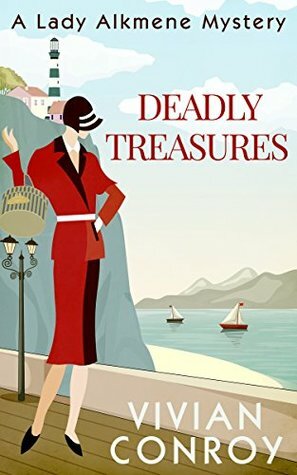 When she gets to Cornwall it is in time to see Duncan being led a I would like to thank Netgalley and HQ Digital for a review copy of Deadly Treasures, the third novel to feature Lady Alkmene Callender, an aristocratic amateur sleuth in 1920s England. Alkmene is asked by her father and his friend to go and visit her childhood friend, Duncan, on his dig. Envisioning a trip to Egypt she accepts with alacrity only to find that the dig is in Cornwall and both fathers want Duncan and Alkmene to marry. When she gets to Cornwall it is in time to see Duncan being led away to assist the police with their enquiries into a recent murder. Certain of Duncan's innocence she calls her reporter friend, Jake Dubois to do some digging on the victim and her prime suspect, Simon Peartree who seems to hate Duncan. Deadly Treasures is a light, easy read. There is enough intrigue and suspects to keep you turning the pages, although none of their motives really ring true when revealed. Alkmene and Jake seem to have no problem unearthing information the police can't. It's all a bit facile, not helped by the Americanisms which creep in to this very English setting. Before I start the review I have to mention the book covers for this series as they are stunning. Deadly Treasures is just as lovely and it is a perfect fit for this series. Even though this book is the third in the series it can be read as a standalone. I wouldn't say that there would be any confusion reading this book first. It is such a fun cosy mystery series though so it is worth starting at the beginning and getting a better feel for the characters. I have to say that it was lovely to see J Before I start the review I have to mention the book covers for this series as they are stunning. Deadly Treasures is just as lovely and it is a perfect fit for this series. Even though this book is the third in the series it can be read as a standalone. I wouldn't say that there would be any confusion reading this book first. It is such a fun cosy mystery series though so it is worth starting at the beginning and getting a better feel for the characters. I have to say that it was lovely to see Jake and Alkmene team up again as they have such a great partnership. With them complimenting each other perfectly as they discuss the case seemingly finding dead ends until they hit upon a clue. Lady Alkmene is a strong and determined character that is easy to like. The story gets going straight away and I even though I felt sorry for Alkmene when she found out where Duncan actually is I also couldn't help but smile! There is a murder to solve with a few suspects along the way to keep Alkmene and Jake busy. The plot moves pretty smoothly and for the most part kept my attention. I quickly read this story in one evening as there were a couple of twists that kept things moving along nicely. I really hope that there will be more adventures with Alkmene and Jake! Adventure, mystery and hidden treasure! I read the first book in this series a few months ago and said that I loved the idea but didn't think the book quite delivered. Now I've returned to read book three and I think the series has improved although it's still a little flawed. The dialogue is better - but still has some bits that sound quite odd. Having not read book 2 I was a bit puzzled by a few aspects of Alkmene's relationship with Jake but I was mostly ok with it. I thought that the cast of characters was slightly too big and not well enough developed and the mystery, which had plenty of twists ended up being wrapped up too quickly and easily and brought the book to a bit of a halt. I am reading books with unusual names for the ladies! In this one Lady Alkmene Callender is anyway an unusual lady for her times. Disinterested in marriage and deaf to the match making tricks of all her relations including her father, a visit to an archaeological site is one she cannot resist, in spite of a prospective groom being the bait! Finding the groom to be a suspect in a murder case does not deter Alkmene who uses all her detective skills to find out who the real culprit is. The fact that I am reading books with unusual names for the ladies! In this one Lady Alkmene Callender is anyway an unusual lady for her times. Disinterested in marriage and deaf to the match making tricks of all her relations including her father, a visit to an archaeological site is one she cannot resist, in spite of a prospective groom being the bait! Finding the groom to be a suspect in a murder case does not deter Alkmene who uses all her detective skills to find out who the real culprit is. The fact that she and journalist Jake are also under threat does not deter her at all. The third outing in the Lady Alkmene Callender Cosy Mystery series finds Alkmene on a jaunt out to an archaeological site to reacquaint herself with the son of the family she spent childhood summers with. While this trip has been partially orchestrated by her father from abroad in hopes of making a match for Alkmene, she arrives to find her potential husband being arrested for murder. Another country village setting, a new murder to investigate, and a family friend to exonerate, along with a new The third outing in the Lady Alkmene Callender Cosy Mystery series finds Alkmene on a jaunt out to an archaeological site to reacquaint herself with the son of the family she spent childhood summers with. While this trip has been partially orchestrated by her father from abroad in hopes of making a match for Alkmene, she arrives to find her potential husband being arrested for murder. Another country village setting, a new murder to investigate, and a family friend to exonerate, along with a new cast of characters all lend themselves to an interesting but somehow slightly lackluster adventure. Perhaps Alkmene's using the free trip offered by the Woolsbury patriarch with the intention of immediately scuttling any match between her and Duncan Woolsbury set the wrong tone, or perhaps it was the lack of well drawn secondary characters, or the preponderance of telling over showing that left this entry in the series, while still enjoyable, feeling a bit wanting and the story slightly unclear in retrospect. Nevertheless, this was a pleasant way to spend a few work lunches and I am looking forward to reading the fourth and final book in the series, Fatal Masquerade, quite soon. And though I've previously stated that I'm looking forward to a relationship developing between Alkmene and her reporter friend and investigative partner, Jake Dubois, I am now intrigued by the possibilities of Duncan, though he does have problematic aspects to his character. I read all three books, one after the other. And, I loved them all. Book three developed Lady Alkmene's character even more. I love her character. But when are they going to investigate the London blackmailer. Hope that's going to be what book four is going to be about. Lady Alkmene grew up with a somewhat peripatetic existence, moving from house to house while her father was on botanical explorations and after her mother died. One boy that never seemed to care was Duncan Woolsbury. He used to torment her and Alkmene used to do her best to get even. Now Duncan is getting older and his parents are afraid that he's never going to get married and present an heir to the viscountcy. They want Alkmene to present herself as a candidate to be his wife. She's very excit Lady Alkmene grew up with a somewhat peripatetic existence, moving from house to house while her father was on botanical explorations and after her mother died. One boy that never seemed to care was Duncan Woolsbury. He used to torment her and Alkmene used to do her best to get even. Now Duncan is getting older and his parents are afraid that he's never going to get married and present an heir to the viscountcy. They want Alkmene to present herself as a candidate to be his wife. She's very excited to travel to some far away place like Egypt or the Himalays. Unfortunately, it turns out he's excavating a medieval village in Cornwall. When she arrives, Duncan is being held in between two constables. It seems a man was killed on the work site, his head bashed in with Duncan's own hammer. And there is a lot of intrigue around the site, supposedly there is a pile of gold buried somewhere in the castle. Duncan may have found some of it but there are plenty of people that would like for him to fail. So was the man killed because of something he did or to prevent Duncan? I would have liked to see more character development in both Lady Alkmene and Jake Dubois. We're in book three and they're pretty much the same people we met in the first book. I am a 'cosy mystery' aficionado .. in between crime thrillers and rom-com's they are my choice. I was looking forward to reading this one, especially as the cover would seem to signal it is a period mystery. However, it dragged until half-way through, until then it seemed there was one suspect. Then it began to pick up again but it niggled at me that the language didn't match the setting. A 'lady' saying 'maybe' when 'perhaps' would be much more in keeping with her status, and referring to a wid I am a 'cosy mystery' aficionado .. in between crime thrillers and rom-com's they are my choice. I was looking forward to reading this one, especially as the cover would seem to signal it is a period mystery. However, it dragged until half-way through, until then it seemed there was one suspect. Then it began to pick up again but it niggled at me that the language didn't match the setting. A 'lady' saying 'maybe' when 'perhaps' would be much more in keeping with her status, and referring to a widow woman as 'Ms.'?? Surely, it would be Mrs. or even more likely missus. I wasn't overly involved with the mystery. I like ones where all the facts are laid out and the reader gets the chance to see if they can solve it, rightly or wrongly. There was far too much of it inside Alkmene's head, and Jake did very little to contribute - he was very much in the background. Certainly not a partnership. I'm not usually so picky - generally I get caught up in the story but this one failed to capture my imagination and it's not a series I would delve into again. I received an arc copy of this novel from Net Galley in exchange for my honest and unbiased review, which this is. I have to say that I'm going to be completely and utterly smashed if Deadly Treasures is the last of Vivian Conroy's Lady Alkmene mysteries. It's the third that I've read since September and the thought of being without new adventures for Alkmene and Jake gets me a bit misty-eyed. As has been the case with the others in the series, it's a fabulously told story that constantly had me guessing. Of course, it also doesn't hurt at all that I have an enormous book crush on Jake Dubois. I may have a w I have to say that I'm going to be completely and utterly smashed if Deadly Treasures is the last of Vivian Conroy's Lady Alkmene mysteries. It's the third that I've read since September and the thought of being without new adventures for Alkmene and Jake gets me a bit misty-eyed. As has been the case with the others in the series, it's a fabulously told story that constantly had me guessing. Of course, it also doesn't hurt at all that I have an enormous book crush on Jake Dubois. I may have a wee crush on Alkmene, too. Each book sees her a bit more confident and bit spunkier and I love the back and forth between her and Jake (and, well, her and anyone who may underestimate her!). I received this eBook for free through NetGalley in exchange for my review - and my opinion is it biased by having received the book for free. I rather enjoyed the book, and how it was written - as if it was straight out of their thought pattern while trying to solve the case. The continual presentation of potential suspects left me wondering who did it... and I was fairly surprised with the end verdict. It's the 1920's and the murder investigations of Lady Callender and Jake Dubois continue, when Alkmeme is asked by family friends the Woolsbury to visit their son Duncan, who is on an archaeological dig. She arrives just as Duncan as being arrested for murder. Can she and Jake discover the real murderer and why. This was an enjoyable read, and a decent mystery with a good interaction between the two main characters. I have absolutely loved these mysteries and all 3 of them have kept me guessing. I'll also admit a big crush on Jake Dubois (& Alkmene!) and surely hope they are set for more adventures in 2017! Thanks HQ Digital and netgalley for this ARC. Great third book in series. Best of the three- with Alkeme in the zone.